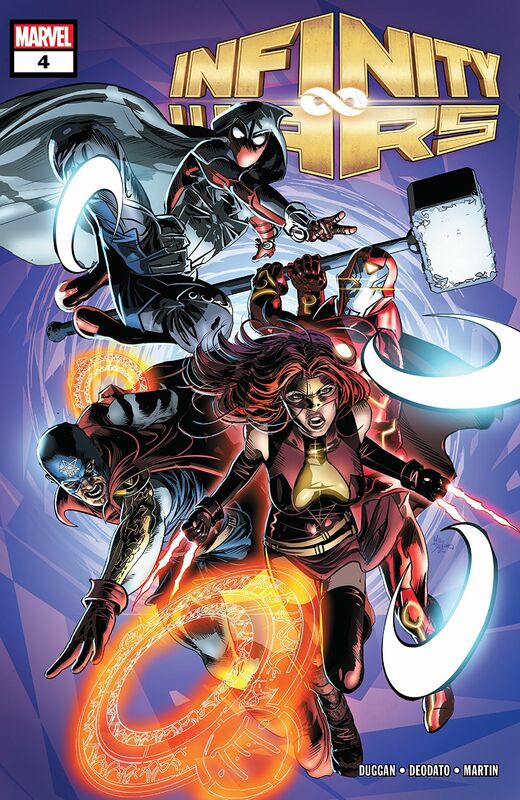 Infinity Wars #4 review: Splitting up is hard to do – AiPT! Relationships are the core of this story and, in the end, will determine the fate of the multiverse. If nothing else long-term comes out of Gerry Duggan and Mike Deodato Jr’s Infinity Wars saga, let the mashed-up versions of supers exist forever. I want to name all of them, have Pop Vinyls stacked on my shelves (MIB, of course), and see the insane power and personality combinations that come from Gamora’s attempt to not follow in her adoptive father’s gigantic, purple footsteps. While the current holder of all six Infinity Stones rushes towards the ends of the universe, trying to spin a new reality for herself, other universes fall, one after another, to the might of Requiem/Gamora. Over and over again, no matter the opposition, her might and will win out. Meanwhile, inside the Soul Stone, Just Loki finally convinces Logan Stone that he is for real and — thanks to a Phoenix Force future version of the duo armed with the TIME BAT — manages to split them apart in the most disappointing comics moment since Catwoman left Batman at the altar. Seriously, who doesn’t want to see this version of Wolverine forever? He’s delightful, articulate, and well dressed. After the split, the Wolvie part is happy to just murder giant soul spiders while Emma (now with the Power Stone) and Loki scarper off to find more dreams of mine to shatter. In this issue, we see several pairs split unceremoniously, but we also get to see a few other combos that defy logic and give me little bits of joy even now as I write. Forgive me for just listing them here, but I need this bit of happy: Kamala Kang (or The Marvelous Ms. Kang), Ant-Hulk, Moon Squirrel with Devil Squirrel, Arachnight, the Soldier Supreme, Ghost Panther, Weapon Hex, The Thingy Torch, The Fantastic 2, Iron Hammer, and some Man-Thing combo I’m not even sure of. Oh, and Drax the Destroyer somehow in the body of a jazz saxophonist named Art. This is the greatest comic ever written. One real moment that sticks with me beyond the wonder of possibilities this mashed up universe could have is an alternate universe confrontation between Requiem and the pair of Phyla-Vell and Moondragon. Caught in what might be their final moments before being killed, they share a kiss and Moondragon offers up the final Infinity Stone Requiem needs in exchange for her lover’s life. It is an act of love and eventual defiance that makes the couple immediately relevant in the story as well as continuing Marvel’s commitment to story-driven diversity. As much as I applaud the clever twists and turns in the story, the emotional content is what will keep this series among the best we’ve seen in years. No matter what, relationships are the core of this story and, in the end, will determine the fate of the multiverse. As much as I applaud the clever twists and turns in the story, the emotional content is what will keep this series among the best we've seen in years. No matter what, relationships are the core of this story and, in the end, will determine the fate of the multiverse. ...except for Loki's goofy smile. They split Kamala Kang without ever spending any time with her? !